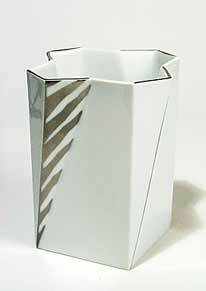 B and G Futura vase - 5" (127 mm) high. For most of its existence Bing and Grøndahl was the second most important producer of ceramics in Denmark. It was started in 1853 by Frederik Vilhelm Grøndahl, an ex-Royal Copenhagen Factory employee, with the help of Jacob Herman and Meyer Herman Bing who were art dealers. Herman and Bing's chain of retail outlets were to prove valuable to the company. Grøndahl's two sons joined the company in the 1880s in administrative and technical managerial capacities. The company is known for its high quality table and artistic wares in porcelain and stoneware. It has won many awards and employed many fine designers, most notable of whom is Jens Dahl-Jensen. In 1987 it was bought by Royal Copenhagen.